What do Lego and MSX have in common? You can both use your imagination and build things with it. It is unlimited, it is fun and can be challenging. It's up to you. MRC user Hamlet must have had the same idea when he constructed an MSX out of Lego. 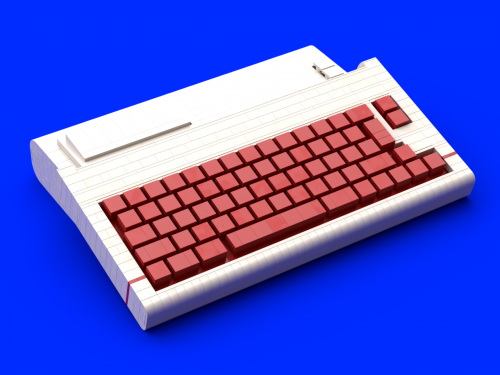 Lego gives the opportunity to create and design a new MSX computer according to your own wishes. Best of two worlds, acting as one. To built is to share, here's the change for you to own a Lego MSX yourself. Visitors from the recent MSX fair Nijmegen might have seen the exhibition of Hamlet's DIY computer cases. Made out of Lego. Or perhaps you've seen some pictures of these machine, here on MRC. Either way, these brick by brick build Lego machines are fantastic eye candy. The cases offers space for a Mini-ITX board or single-board computers like the Raspberry Pi or the Turbo Chameleon 64. There's space for a power-supply and cut-outs for cartridge ports as well as the possibility to customize the keycaps of the keyboard. The displayed cases are decorated with a mechanical Cherry keyboard with freely select-able key switches, which offers an incomparable writing experience on an MSX computer. The possibility to integrate existing bricks into the set makes the price-conscious MSX fan happy. The parts list of Hamlet's examples are available in the MRC download data base and can be ordered from online portals such as Bricklink. Also a detailed construction manual can be found there free of charge. An even easier solution to build such a case is to support the MSX case project at LEGO Ideas, a platform for MOCS (MOC simply stands for "My Own Creation") building blocks. Hamlet has his own profile here where you can vote for his builds to get it in production and be able to buy it as a complete kit. In order for LEGO to officially offer this set for sale, Hamlet only needs 10.000 votes for this. Although it is necessary to register to vote, it is a unique chance for us MSX geeks to stand out. Having these complete kits would be a lot cheaper than putting the components together individually at different dealers. Relive your childhood and get that case of Lego bricks out of the attic, build an MSX! This is very cool!!! And the designs look very well made! A fun idea. The title should say 'let's build'. The pictures look really cool. I'd like to see more but unfortunately Lego Ideas require registering, which is a bit inconvenient if you just want to look around. Lego wants to get more clicks than bricks. There are much more pictures to see on msx.pics and here. That's great, thanks for the link, @hamlet! I`ve loged in and supported te idea. How does it works? it says 45 days remaining for...what? if you reach a number of supporters it is possible they sell the brick packs for building an MSX with legos?? After 100 votes are gathered the project gains one more year to collect 1000 supporters. After that half a year for another 5k and same for 10k. After that LEGO will proof the idea to get it into stores. Well, with supporters like you, it is not impossible to reach! Thanks! I've finally managed to continue working on the LEGO computer case tutorial. A PDF manual can be found in the MRC Downloads, also a Studio software file. Studio is available for free at Bricklink.com and is IMHO much better than LEGO's LDD software and also compatible with it. So it is possible for you to simply design the colors of the model in the software and then export it to Bricklink or another LEGO seller as a list. The red parts of the Modell are the one you do not need when using a real keyboard. This case is made for a Leopold FC660M, but can easily been adapted (well, it is simple as LEGO) to other keyboards of a similar size. 3D printed LEGO keycaps are available at Shapeways.com. If you manage to design your own, please let me know! Lego is not cheap. Depending on color and state, this is a 100 Euro+ build! I have had good experiences with buying used bricks. If you want to build a glossy model I advise you to buy new bricks. Also the locking force is stronger. Repair-Bas have a LEGO shop, he will make you the best price. It is possible to order via Bricklink or contact Bas. If you want to glue the model, I can recommend TAMIYA 87137 ABS CEMENT. In case of an atomic bomb explosion you can hide behind the model. Unfortunately I have not found a supplier for alternative LEGOlike bricks like COBI or LEPIN yet, but a Chinese manufacturer contacted me and inquired about the rights. I didn't earn any money with this project, and I don't want to distribute it exclusively to keep the manual free of charge. I wish you a lot of fun with building now, let me know if you need help or have suggestions. Send me pictures of your model in any case! I am very curious!